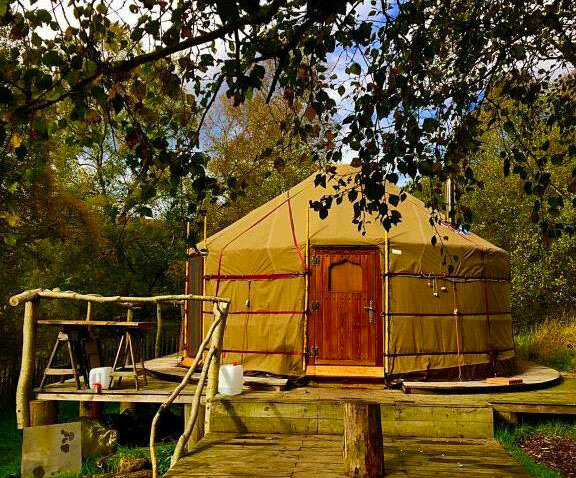 Over the many years that we have been making bespoke yurts for our customers, quite a few have been used as meditation yurts, and for yoga and other health and spiritual practices. The sacred space of one of our insulated meditation yurts is perfect for those pursuing inner peace and happiness through contemplation and meditation. The beautiful circular space, natural beauty and sense of comfort provide the perfect surroundings for deep and peaceful focus and relaxation. With the addition of one of woven tension bands a small stool or cushion the meditation yurt is absolutely perfect. The picture on the side is one of our meditation yurts. A chestnut frame, rustic and natural, the solid 8 spoke traditional crown, a deluxe door with artisan made metalwork, a traditional window in the door, insulated with 100% sheep's wool, lined for comfort, proofed with our weatherproof canvas, and on top of this an outer cover with traditional design. Furthermore, the yurt comes with a wood burner fitted for all year round comfort. We love meditating in our meditation yurt. It is very special and helpful to have space just dedicated to meditation and a yurt is just excellent for it. Yurts can work well for yoga practice. The natural beauty and simplicity of the finish creates the tranquillity and focus needed for yogic pursuits. The intimate and sacred feel of the yurt is very supportive of any form of practice, therapy or bodywork. Whether it is for your own practice or for a group of people, you might want to consider one of our yurts for your yoga space. Sizing the space, deciding what sized yurt will suit your needs can be done as follows. 3) Cut out the yoga mat and make as many identical copies as you want people practising in the yurt. 4) Position the mats into the differently sized yurts until you feel you have found the right size. Furthermore, we can customise the yurt to your specification. A recent example is this glass-fronted yurt in the photo below. Find out more about these amazing glass wall yurts.